On December 16, 1996 KIIS-FM visited Disneyland! Is this how Ryan Seacrest’s relationship with Disney started? Was the Christmas Tree still placed IN the moat by 1996 or is there some cut and paste involved here? 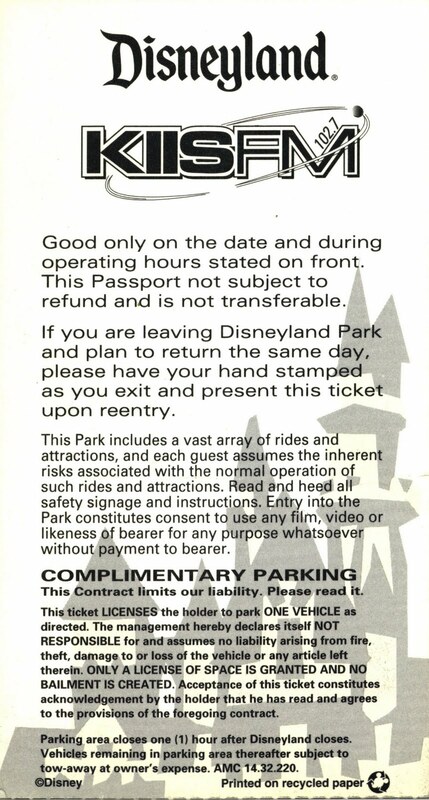 Neat Mid-90’s Castle watermark on the back, too bad the lawyers went nuts and printed legal stuff all over it! 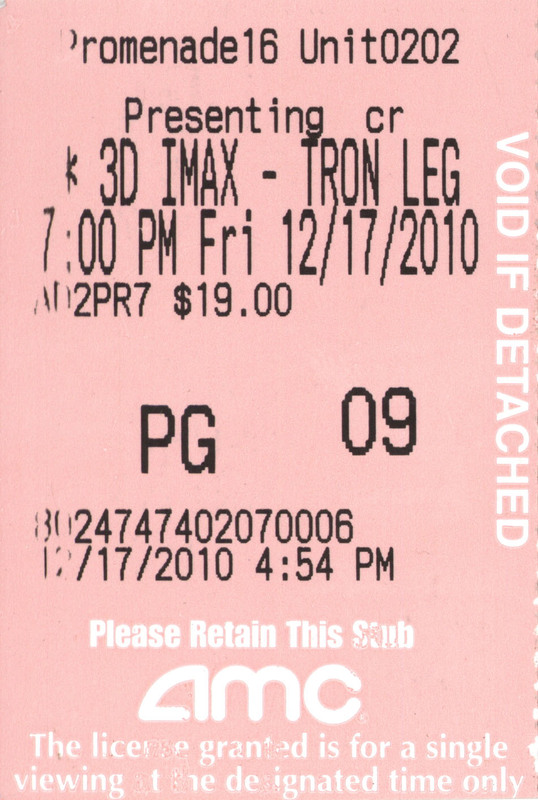 Well here’s two things you don’t see every day; TRON Legacy and a NINETEEN DOLLAR Movie Ticket – Ouch! Yes I could have seen it in regular 3D for a few bucks less, but IMAX is amazing. The movie was excellent, thoroughly enjoyable and I highly recommend it. Jeff Bridges was awesome (all three versions of him) the “1980’s’ version of Bridges was of course computer generated and looked somewhat like a video game, which actually makes perfect sense and ended up working quite well in the movie. It’s got lots of action, a fascinating (if not a bit jumpy) plot line and stellar state of the art special effects – Folks I’ve now been to the GRID. In fact, its uncanny how this “sequel” shares quite a bit with the first movie; Jeff Bridges and Bruce Boxleitner both reprise there roles, TRON and CLU are back, the storyline has a few threads that jump around a bit and the ending comes somewhat abruptly as it slams you back to reality. Go see it! 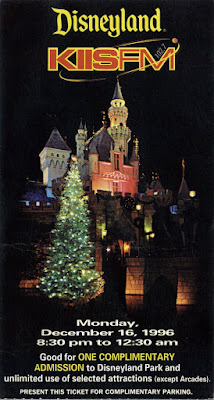 I do believe the two white trees were still being placed in the moat in 1996, but I couldn't tell you what year that stopped. Thanks for the review of Tron: Legacy! I just found photos of the white trees in the Castle moat from 1996 and 1998. 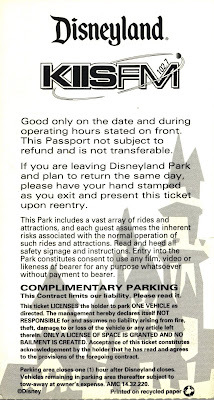 I don't know if the trees were gone by 1999 or not, because I did not renew my annual pass for several years after they destroyed Tomorrowland in 1998! Whoa, $19... I have to admit that I'd almost rather pay a bit more to see a movie in a nice theater with good sound and preferably stadium seating. I'm thinking I might have to check "Tron" out! Hey Major, go see it at the AMC in Woodland Hills. The IMAX theater (#9) is pretty nice, stadium seats, 12,000 watt sound system (WOW) and state of the art DLP projection system that is flawless, hell even a so-so movie would look good with all that!